After being absent for the past few years, we held our second Designer Night at the Races™ in two nights this past weekend. 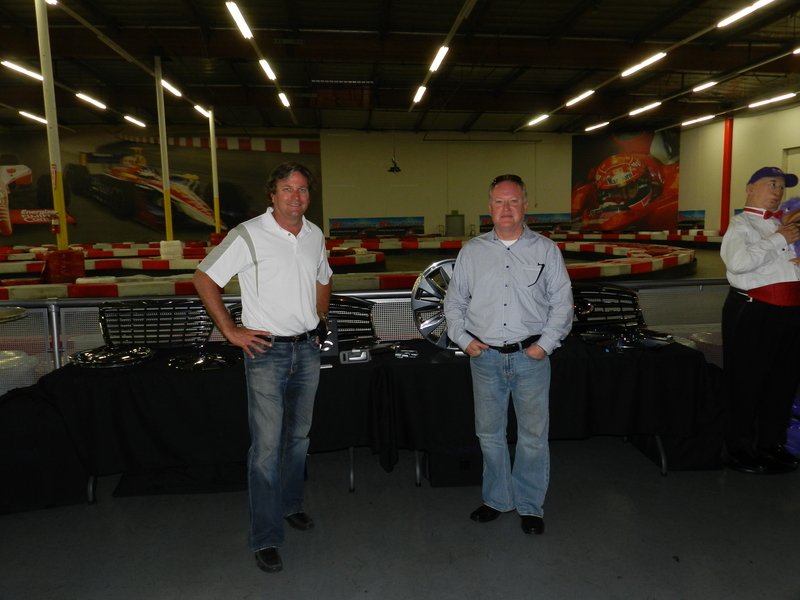 Over 120 Design Staff signed up for one of the two nights of go-kart racing and while there were a few last minute cancellations and no-shows, the remaining racers from Honda, General Motors and Tesla had a blast at K1 Speed Gardena/Torrance on Wednesday night. Not to be redundant, but in case anyone reading this didn’t read yesterday’s report, I need to start by thanking the people who make the event happen. 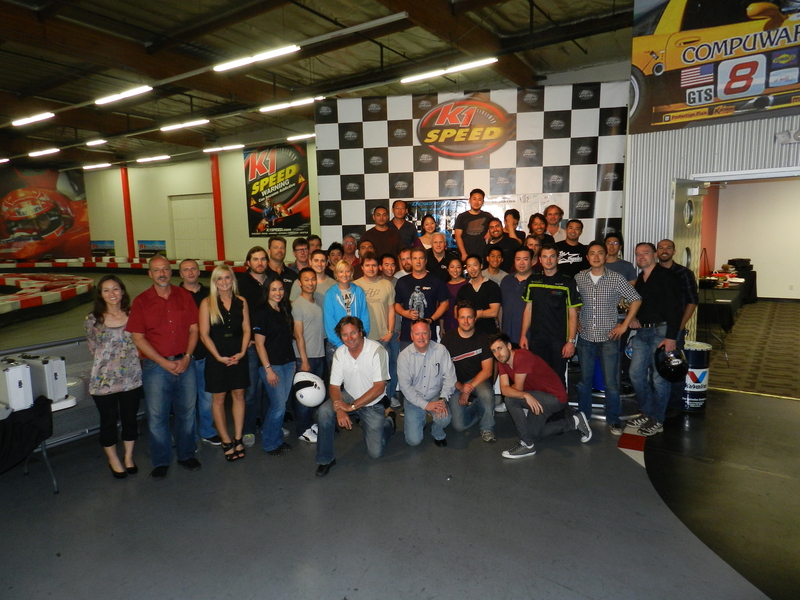 Like my staff at AACS (Steve, Aaron, Brian and Lindsay) and the people at K1 Speed. We managed to fix some of the hiccups from Tuesday only to have a few new ones show up but we did at least get some addition track time thanks to a new sponsor (more on this after the picture). Lacks Enterprises was our title sponsor and has supported every event since the first one in 2006. Lacks provides world-class Automotive Exterior Grilles & Trim, Interior Trim and Wheels in a variety of basic and advanced finishes. Purple Platypus, the exclusive reseller of Objet’s high resolution 3D printers in the Southwest, awarded a 3D Printed trophy to the fastest designer on each night. Luxion specializes in advancing state of the art technology for computer based lighting simulations with products such as their KeyShot software. Bunkspeed provides 3D software, modeling and animation software for advertising, automotive design, photography, architecture and industrial design. 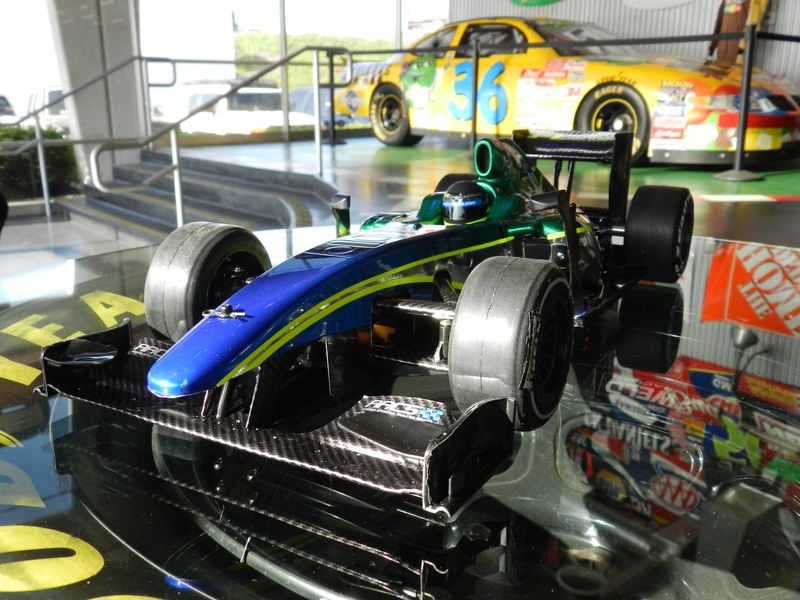 F1Paintlab, which produces radio controlled Formula 1 race cars provided the team “trophy” for the evening that is pictured above. Last but not least is first time sponsor Honda Research and Devlopment; thanks to the last minute addition of their sponsorship we were able to get an additional session of track time for the event, so thanks to Mike for helping make this happen. After a couple of sessions of combined practice and qualifying the final heats were set. In the D-Main, Corey Taguchi won and stood atop a Honda sweep of the podium positions. Following just 5 and a half seconds behind was Calvin Liu in 2nd who was followed by Jesus Chavez, another 1 and a half seconds behind. Chavez also managed the most consistent race of the evening as his average lap time was within 0.486 seconds of his fastest lap. Andre Franco Luis of Tesla also managed the most improvement over qualifying as his fastest lap in the race was more than 3/4 of a second faster than his qualifying lap time. In the C-Main we had another 1-2-3 Honda finish as Michael May finished first in the closest race of the evening. 2 and a half seconds behind was Paul Ventura with Mathieu Geslin about a quarter second behind that for the final podium spot. 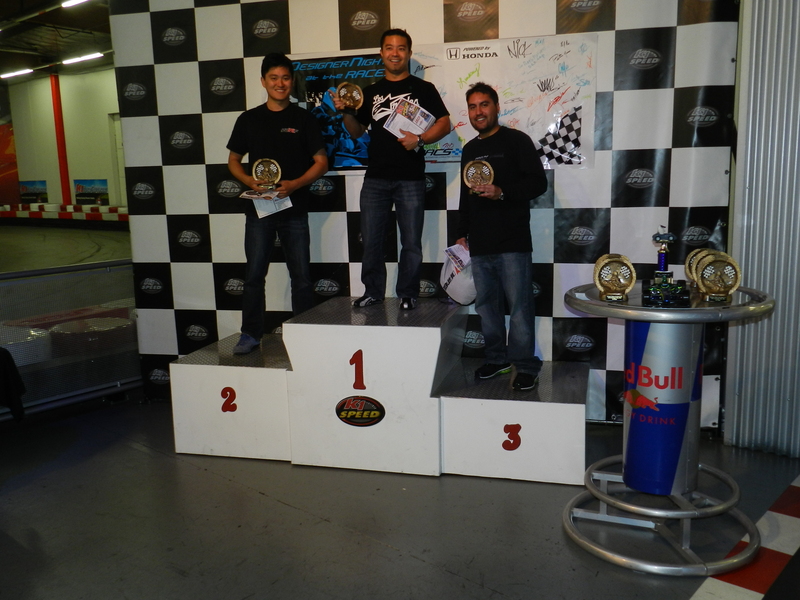 In the B-Main we finally had another manufacturer break the Honda stranglehold of podium finishes as Sue Neuhauser from Tesla split Honda racers Catalin Matei in 3rd and race winner Kevin Kang. 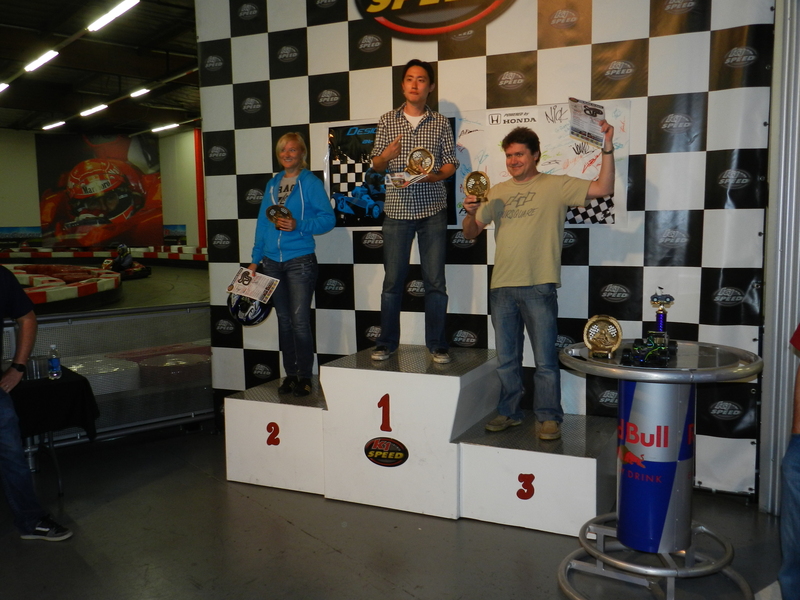 The B-Main also had a couple of “incidents” although none was as bad as the wreck-fest in the public races as we were havingthe awards ceremony. In the final race of the evening two-thirds of the field were Honda drivers so they had a great opportunity to beat Toyota’s finishes from Tuesday and win the overall trophy from F1 Paintlab. 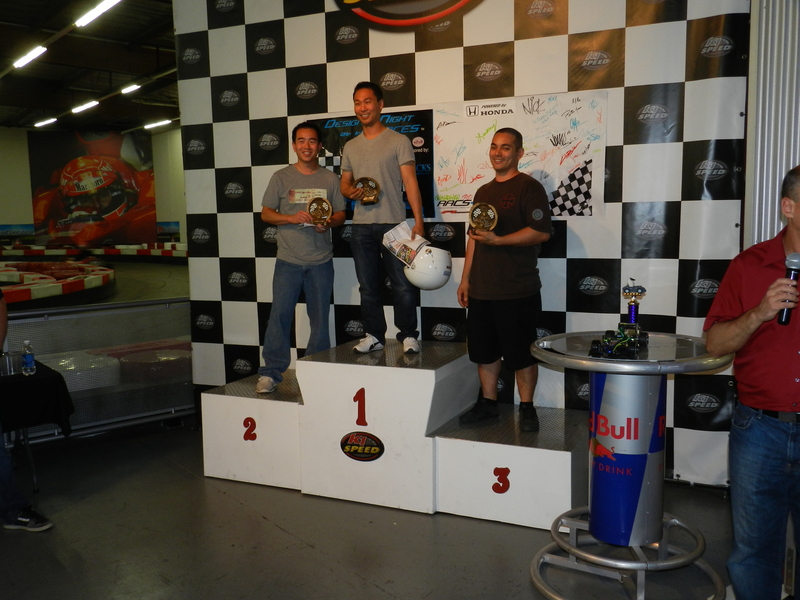 In the end, Bernard Lee from Tesla spoiled Honda’s fun as he ran away from the field with a 7 second win over Honda drivers Garrett Chang and Rudy Caruolo. Honda driver Jiro Ikeda did manage the fastest lap of the evening with a 25.354 and was presented the Fastest lap Award from David Cox of Purple Platypus. 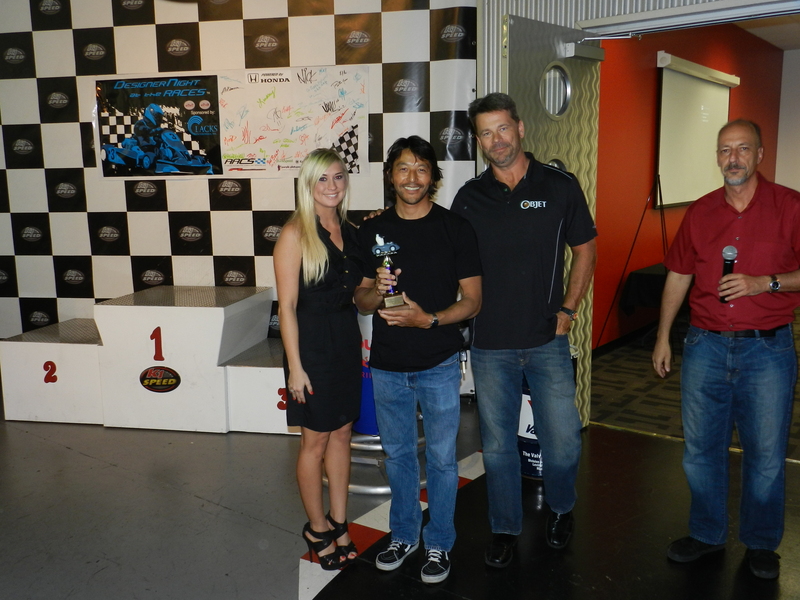 At the end of the evening the final award went to Toyota Calty as the fastest studio in Southern California. The top three drivers from Toyota managed 48 points (using the F1 points system for the A-main races) and added to that by having the 2nd most number of racers for a total of 66 points. Honda managed 63 total points by having the highest number of racers. 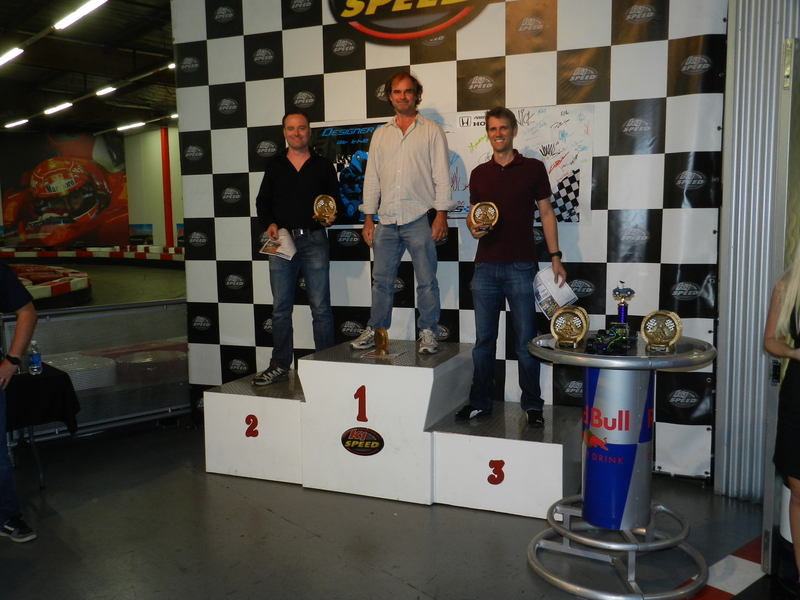 Third place went to Nissan with 43 point, followed by Tesla with 37, and Oakley with 16 points. The sponsors finished 6th with 14 points, followed by GM, Fisker, Mercedes, Hundai, Ford, Kia and Mazda. You can find the entire list of event results, points and pictures on our website at http://www.supplierconsultants.com/designer_night_2012_05#results. I want to thank everyone again for coming out, ESPECIALLY THE SPONSORS and see you at the next event in October! This entry was posted in Designer Night at the Races and tagged Bunkspeed, Designer Night at the Races, Honda Research and Development, Luxion, Purple Platypus. Bookmark the permalink. Thanks again guys! Had a great time! 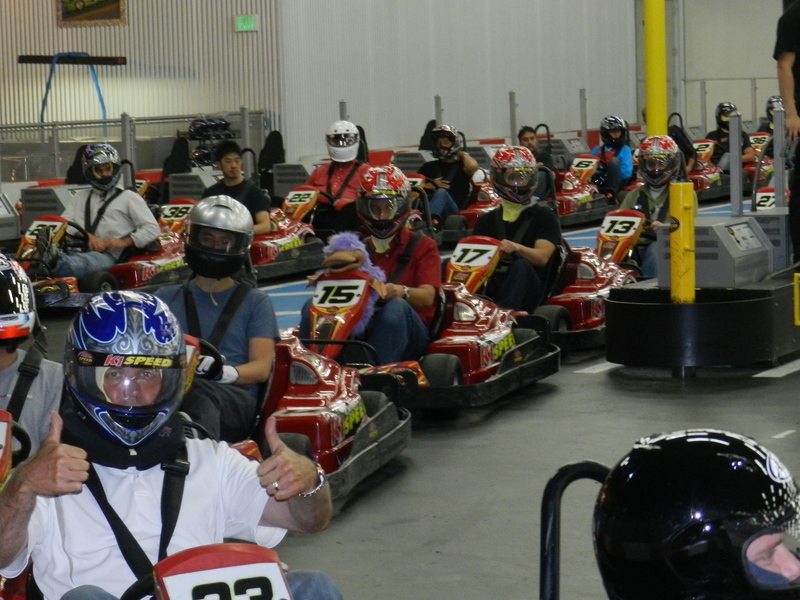 A round of applause to all the folks at Lacks, Purple Platypus, Luxion, Bunkspeed, F1Paintlab, Honda R&D, and K1Speed for another great event. It was a pleasant surprise to see the event return after a few years on “pause.” Although the venue changed from Dromo1 to K1, it’s safe to say that everyone in attendance walked away with the same priceless grin and epic stories to spread around the office. I think I speak for everyone when I say I couldn’t have enjoyed myself more and really appreciate the time spent away from the office with friends from around the industry. Great job everyone and I look forward to the next event!